Bruckner's Fourth Symphony is his most approachable work in symphonic form and has long been a favorite among the most famous German conductors. 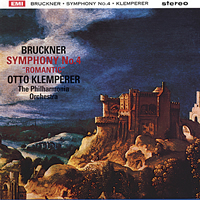 When this recording was made in September 1963, the great conductor Otto Klemperer, at the age of 78, was still at the height of his powers, and had established a close rapport with the Philharmonia Orchestra over nearly a decade. Thirty-three years later, Klemperer's monumental, searching interpretation has never been surpassed and neither has the recording, which in Testament's new transfer perfectly conveys the warmth and sonority of Bruckner's scoring, and superlative orchestral playing.
. It is better to hear and not to understand but to understand them and then do not listen to music" So man wrote called William man in its cover Text to Anton Bruckner's Fourth "Romantic" Symphony. For in the music of the Austrian composer Bruckner, the spirits of his musical survival separated themselves. And he has survived all discussions always - unmistakable. A native of rural simplest ratios Bruckner (1824-1896) was a storyteller. Much has he said about his compositions - and it later discarded again in high bow. "Medieval city - dawn dawn - from the city towers sound wake-up calls - the gates open - on proud horses blow up the Knights out into the open - Waldesrauschen "- of all can hear something, all the romance, and much more. Not for nothing Bruckner is a pioneer of contemporary classical music, he is also" feared "as emotional and aufwallender composers man. He not only lived his feelings, he also made them sound. "Yes, I do not know what I was thinking about," Bruckner said to his own virtuoso finale. You can not say more beautifully - and it sounds just as romantic and beautiful.